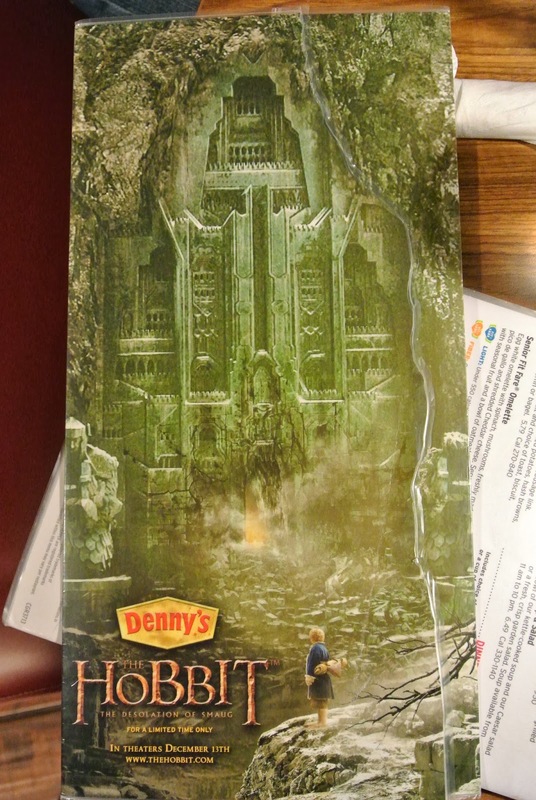 The Desolation of Denny's: The Return of the Hobbit Menu - San Diego Dining Dish! 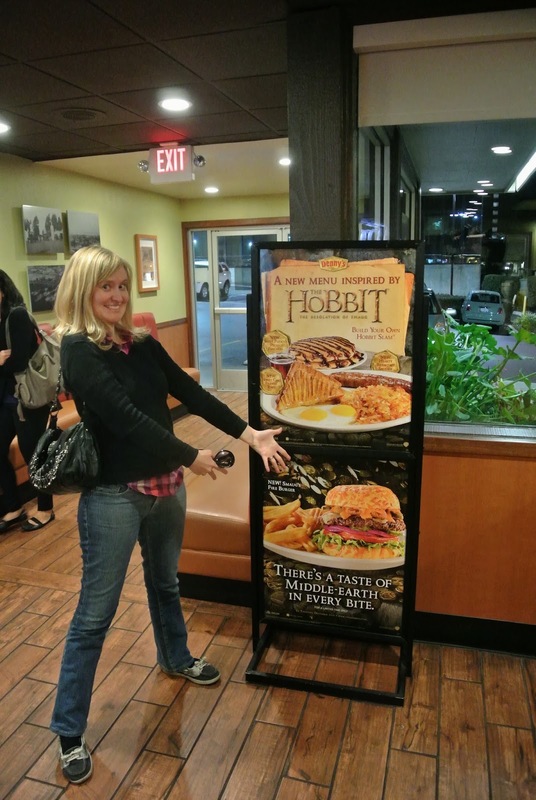 After the fun we had last year reviewing Denny's Hobbit menu, we figured that going again would be a blast. A few days prior, I began scouring the Denny's website in anticipation of our adventure. There were a few changes to the menu, most notably, nearly all of the dinner items had been eliminated. Even still, I was excited; Denny's is better for breakfast anyway. Some new items were to be had: the sweet potato pancakes and honey cake French toast were new additions to the Build Your Own Hobbit Slam dish. Yes, I just wrote that with a straight face. With the company of a few friends, we journeyed through the Mirkwoodian Mission Valley to arrive at the newly renovated Denny's. There were six of us, and only 5 Hobbit-y items for ordering, so there were repeats. No one was interested in the Dwarves Turkey Dinner, so we ordered Bilbo's Breakfast Feast, Smaug's Fire Burger, two Hobbit Slams, and two Hobbit Hole breakfasts. The Bilbo's breakfast feast was...kinda disgusting. The eggs were the "egg food" -- premixed eggs dumped onto a griddle then mixed with spinach, mushrooms, and tons of American cheese. Served with the hashbrowns and "Shire sausage", this meal was barely edible. Hardly good sustenance for a journey to the Lonely Mountain. The Hobbit Hole breakfast was much the same as last year, except far more bland. The eggs were overcooked, and everything was sadly piled in a heap on a plate. I guess that the dwarves aren't big on fancy plating? The Smaug Fire burger was one of the new menu items. What made it a fire burger? Some jalapeno peppers layered onto the burger. While they could have put some kind of spicy sauce on it or some pepper jack too, I suppose most people wouldn't want too much fire on their Smaug burger. 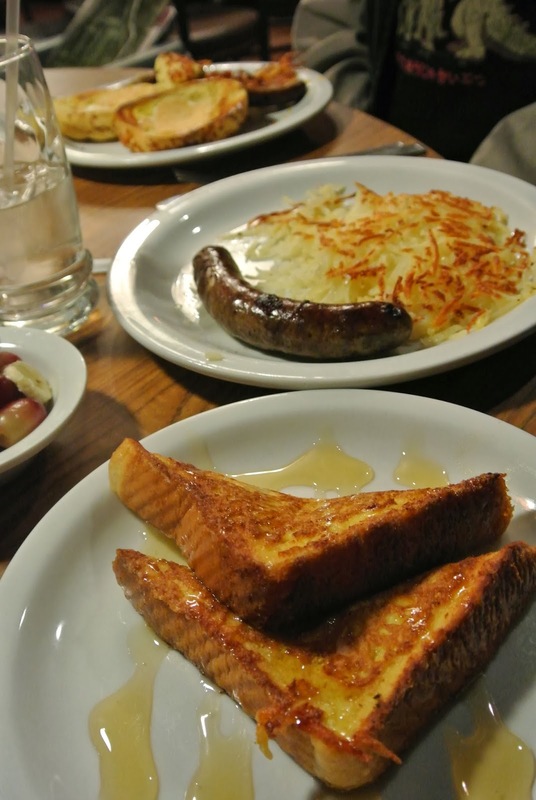 The Hobbit Slams were Middle Earth versions of their Grand Slam breakfasts. The honey French toast was incredibly sweet, and drizzled with honey product. We all agreed that the French toast was way too cloying. The other carb option, and new menu item for the Hobbit menu was the Sweet Potato pancakes. The only problem was that this particular Denny's was fresh out of the proper mix, so we got wheat pancakes instead, with the candied pecans and cinnamon syrup that comes with the sweet potato pancakes. These pancakes were better than the French toast, but mainly tasted like a dense cinnamon roll. All in all, I was pretty disappointed with this trip to Denny's. The menu had very few new items, and much less variety than last year. It felt kind of phoned in. Even doing this review felt very....meh. I really hope that they continue the menu for the final film, but I do hope that more effort is put in next year. Come on Denny's step it up for the last film! The fire comes from my one ring.